SimStaff is the premier technical recruiting and staffing agency in Dayton, Ohio for companies trying to fill complex skilled positions. SimSTAFF takes pride in creating a lasting relationship between its clients and the candidates, with the help of successful and proven recruiters that are tailor-made to meet every client’s needs and envied by most of our competitors. Our technical staffing services works with a variety of major industries and our specialty placements include engineering, programming, gaming and simulation staffing. We have built a solid reputation with companies throughout Dayton for providing highly skilled and experienced technical professionals in a timely and professional manner. In Dayton and across the State of Ohio, our experienced team at SimSTAFF has built relationships around the area, so that any kind of complex skill requirement can be met with a quick turnaround time. Employers place complete trust in us and our staffing services, as they are confident our proven recruiting strategies will find a candidate that perfectly suits their needs. 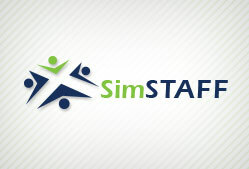 The team at SimSTAFF are highly motivated, skilled and have been provided in-depth training along with flexible and proven hiring strategies to create that lasting impact on the companies we work with. How do we find the Right Candidate? For any company, performance and productivity is the key to its success. SimSTAFF understands it completely and hence utilize our comprehensive and innovative staffing strategies to find, screen and place the right employees in the right job. Our recruiting staff doesn’t wait for the professionals to come to us, but our proactive recruiting techniques proactively seek out the best candidates for both permanent and temporary positions. Our technical team ensures that the candidate not only meets all your technical qualifications, but also makes sure that they fit perfectly into the culture and the environment of the company. Our key team members are always available via email, phone or text to respond to any emergency requirements or queries. Our premier recruiters can be contacted directly to handle any concerns or address unexpected problems immediately. Contact us today at 407-965-2596 to discuss you hiring needs or employment options.